This might sound difficult to believe, but I have never actually read F. Scott Fitzgerald's famous book. Nor have I ever seen any of the previous film adaptations of the novel. I do recall the novel being mentioned a few times in Nelson DeMille's novel The Gold Coast. In fact, although I knew nothing about the premise of The Great Gatsby, neither the plot nor the characters, I had a feeling that I would know the story based on the influence it provided on what I believe to be Nelson DeMille's finest literary achievement. Indeed, once you take out The Godfather influence, Nelson DeMille's novel really is the reincarnation of The Great Gatsby. 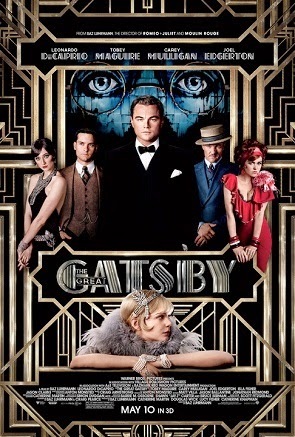 This movie, however, seems to be a glimpse into the world that F. Scott Fitzgerald created in 1925 before dying in 1940 believing himself to be a failure as an author. Fitzgerald's story is almost as tragic as that of his literary creation Jay Gatsby in that both of them seemed to dream big, but neither were granted the ability to make their wishes come true. Fitzgerald never made it big during his lifetime and Gatsby never got his girl. Fitzgerald only became a literary hero years after his death and to this day his once mediocre selling novel The Great Gatsby is now mandatory reading for many high school classes. As is the case with many other authors and musicians, Fitzgerald only became popular with the masses after he died. And it took a second World War to help accomplish that. Some folks just can't get a break. As for this 2013 adaptation, I'm not sure how many breaks I want to give it. I certainly enjoyed the movie, but it's not without its flaws. I'm not exactly thrilled that I had to spend so much time listening to Tobey Maguire's voice (can't stand him) or watch some out-of-place special effects during certain car scenes and close-ups, but those things by themselves aren't a deal breaker. However, I really didn't like the out-of-place hip hop soundtrack. I'm not too familiar with Baz Luhrmann, but I've read up on his works and I understand he's done this kind of thing before; however, it's just doesn't fit with the world presented in The Great Gatsby. A straightforward jazz approach would have done this movie wonders. At times I actually laughed when I saw how everyone was dancing to hip-hop. Seriously. It completely took me out of the movie. I really hope that people fifty or sixty years from now are smart enough to know that people didn't dance like that or to that kind of music in the 1920's. Hip hop didn't exist in 1922. Neither did the racial equality this movie magically seems to have. For whatever reasons this movie seems to shun the historical setting of Long Island in 1922 in favor of a fantastical and over the top hybrid story of history and fantasy. I'm not quite sure Fitzgerald envisioned things like this. However, Leonardo DiCaprio really is the glue that holds this movie together. Although he is largely absent for the first half-hour and we are forced to hang around with Maguire the entire time. Once Gatsby's character is actually introduced I think the movie begins to find itself and as the movie continues it gets much better. The soundtrack even gets better as the movie goes on. I suppose that is because once they got the obligatory Jay-Z stuff (he helped produce it) out of the way at the beginning they could move on with the real music later in the movie where songs like Jay-Z's 100$ Bill wouldn't exactly carry the same emotional weight. Once this movie stops trying to be silly it really becomes a very good movie. Good enough to make me want to pick up the book and meet the true world of Gatsby. This movie could have been so much better, though. I still enjoyed it, but a better soundtrack, less Tobey Maguire, and a slightly toned down approach would have made a world of difference. So thumbs up but with some reservations. I haven't read The Great Gatsby either. I'm planning on seeing the movie but when you started talking about the hip hop music in the movie it sent up a red flag for me and made me think of the only Leo movie that I didn't like, Romeo and Juliet. In that movie, they used a modern setting but spoke the actual words of the play and had a modern soundtrack. It was totally weird. The modern setting is ok with me but you speaking like it's 1595 in a modern setting is ridiculous. Anyway, I looked it up on IMDB and guess what? These movies have the same director. So now I'm a little wary of this. I remember seeing Romeo and Juliet a long time ago. That one didn't leave much of an impression on me, good or bad. I looked up the movie on IMDB to try and refresh my memory a bit. Curious to see that both Paul Rudd and Jamie Kennedy were in that. It's hard for me to picture those two quoting Shakespeare. Oddly enough. Paul Rudd was also in an adaptation of The Great Gatsby from 2000 and he played Nick Carraway, Tobey Maguire's character in Luhrmann's version. I rented The Great Gatsby from netflix and decided to read the book first. Somehow, I got through school and never had to read it and I have always stayed away from the book because I thought it would bore me. I was wrong about that. It was a great book. It's only 182 pages (more or less depending on your version), so if you ever want to give it a try, you can rip through it pretty quick. Now I'm ready for the flick but I found the Robert Redford version is available for streaming on netflix, so I'm watching that one first before the Leo one. Anyway, I was shocked at how much I enjoyed that book. I didn't realize the book was so short. I never read a lot of the classics in school. My grades each year when I first got in English were horrible because I never read the summer reading stuff. I was busy reading IT or The Dark Tower series when I should have been into the summer reading. Of course, I always ended up getting pretty decent grades so it didn't hurt me that much. It's just that for a little while each year my English teachers thought I wasn't very intelligent, lol. I've yet to see the Robert Redford version.